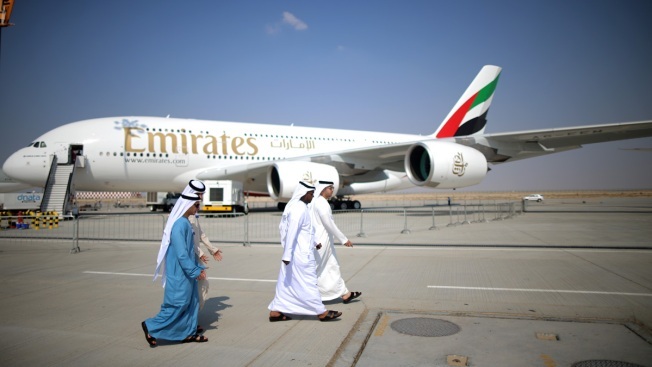 In this November 18, 2017 file photo, businessmen walk past an Emirates Airbus A380 during the Dubai Airshow on November 18, 2013 in Dubai, United Arab Emirates. U.S. authorities issued an emergency order Monday requiring additional screening of cargo on flights departing for the United States from five Mideast countries, citing a threat of terrorism. The Transportation Security Administration order is aimed at preventing terrorist attacks in response to "persistent threats to aviation," TSA said in a statement. The countries falling under this order are Egypt, Jordan, Saudi Arabia, Qatar and United Arab Emirates. The countries were chosen because of "demonstrated intent by terrorists groups to attack aviation from them," the statement said. TSA said most of the requirements of the emergency order are already being carried out voluntarily by airlines in some countries, but didn't identify the countries. Airlines that TSA said are affected by the order are EgyptAir, operating out of Cairo International Airport; Royal Jordanian, operating out of Queen Alia International Airport; Saudia, operating out of King Abdul-Aziz International Airport and King Khalid International Airport; Qatar Airways, operating out of Doha International Airport; and Emirates and Etihad, operating out of Dubai International Airport and Abu Dhabi International Airport. EgyptAir, however, previously stopped accepting cargo shipments on flights to the U.S. at the request of American authorities. Under the requirements of the order, airlines are supposed to provide certain information to U.S. customs officials on the shipments "at the earliest practical point" before loading the cargo. The shipment information is then compared to information the U.S. has on terror threats. A foiled plot last summer to smuggle a bomb aboard an Etihad plane bound from Australia to UAE is "an ominous reminder" that "we need to continue our efforts to keep our skies secure," the agency said. Abu Dhabi-based Etihad said in a statement to The Associated Press that it was "fully compliant with all regulatory security requirements across its operations." It declined to elaborate on its security procedures. Abu Dhabi International Airport already has a U.S. Customs and Border Protection facility that allows passengers to clear screening they'd otherwise have to go through when landing in America. That means passengers can walk right out of the airport on arrival. Dubai-based Emirates, Qatar Airways and Saudia didn't respond to requests for comment. Gulf and Mideast airlines already were stung by President Donald Trump's travel bans, as well as last year's since-lifted ban on laptops in airplane cabins. U.S. carriers have accused also Gulf-based airlines owned by governments of having unfair advantages in the market, something they've firmly denied. Associated Press writer Jon Gambrell contributed to this report from Dubai, United Arab Emirates.